We are constantly looking to recruit new agents. As our commission structure is very competitive, this provides excellent business opportunity for people who are looking to expand their business in Immigration field or even for people who are thinking to open a new business. We offer a very attractive profit sharing program along with excellent marketing tools to our agents. 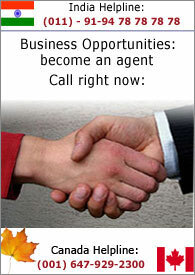 We are looking for agents not only from within Canada but also from overseas. Reliable Immigration Consultancy and Representation. Provide you a login id to our website where you can submit your queries and see your progress. Assist you in marketing strategies and provide you various advertising techniques. Provide you powerpoint presentation to explain business structure. Willing and able to advertise to promote the Immigration Programs. Follow the guidelines stated in the agent contract set by Wisdom Immigration Consultancy Services INC.
Well established office space with staff and infrastructure. Should have excellent people skills. Provide us a brief reason why you want to work as our agent. Contacting members of your community, either in Canada, or in a country where you know persons, regarding immigration. Entering into a relationship, with other persons, who in turn could refer clients to us.